Old and Beardy…I mean, Antigua and Barbuda. This week we head to the Caribbean, to the twin island nation of Antigua and Barbuda. Like many countries in this part of the world, their names come from the Spanish explorers that laid claim to them; in this case, their names mean “Ancient” and “Bearded”. There are actually several islands that constitute part of the nation, but the primary two are the largest and most inhabited. Though named by the Spaniards, the islands were settled by the English, first Antigua in 1632, then Barbuda in 1684. They remained members of the British Empire until 1981. Thus, like many countries, they recognize the British Monarch, but conduct their own parliamentary system with a Prime Minister. The British influence continues in the culinary tradition of the islands. The largest animal in the Eastern Caribbean is the Antigua Barbuda Fallow Deer, which are descended from those which were brought over from England by the original colonizers of Barbuda at some point in the early 1700s. Growing up on an island myself, I always found it interesting when non-indigenous animals become a part of the landscape. On Long Island, for example, both fox and deer seem like animals that are more at home in vast wooded areas, and though L.I. has forests, I couldn’t figure out how they got there (I can’t picture a deer swimming the Long Island Sound), and that was only a few miles from the mainland. Picturing a deer on a remote Caribbean island seems almost magical. Nevertheless, the population has ebbed and flowed throughout the centuries, as is often the case with invasive species. Finding a recipe from this country was surprisingly difficult, as the cuisine of the Caribbean is often indistinguishable from locale to locale. So when I came upon the anomaly of a venison dish in the Caribbean, I knew I had found the one. Coincidentally, I had a pound of venison in my freezer, courtesy my wife’s grandfather, which had been waiting for the ideal usage. This was especially lucky, as in Ohio it is illegal to buy or sell deer meat. With one challenge averted, I went on the hunt for an ingredient I knew nothing about: sorrel petals. This spinach-like plant proved impossible to acquire on short notice, even after inquiring with gourmet food markets. In lieu of this, I used… you guessed it, spinach. The resultant sauce was savory, yet a little sour. I can honestly say it’s unlike anything I’ve ever tasted before. 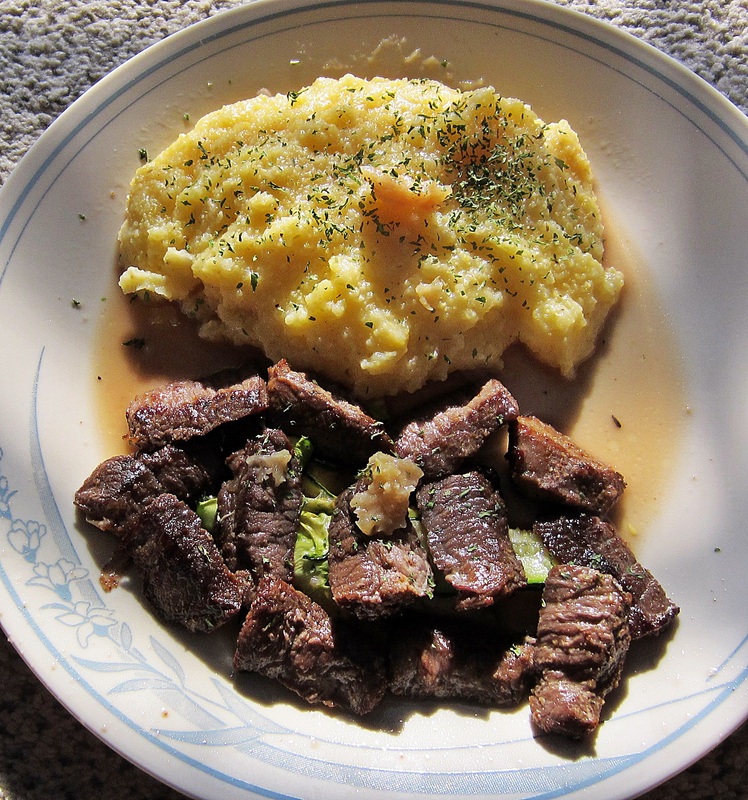 The deer was marinated for two days, which made it tender and flavorful. The marinade included a Cajun spice blend, which the deer was then again coated with prior to cooking. I really enjoyed the flavor of the deer, as well as the texture. It’s a protein that I rarely eat, but applications like this make me realize it doesn’t have to be gamy or just a big slab of meat. As a side dish, I prepared what I would call polenta, which is almost identical to an island dish called fungi (fun-gee, not fun-guy like mushrooms). Zucchini was also recommended as a native vegetable, so I prepared baked ribbons, which went with the venison very well. The garnish of roasted garlic was also a nice accent to the meal. Overall this dish was easy to make, extremely quick to come together, and enjoyable to eat. In a glass dish season the tenderloins with Cajun seasoning and soy sauce, then rub with oil. Cover dish with cling film and refrigerate meat for up to 2 days. In a saucepan over a medium-high heat reduce the port wine and sorrel sepals. Add the shallots and stock and reduce the sauce by half. Once thickened, reduce the heat and continue to simmer slowly for 10 minutes. Add the cream, cumin and salt and pepper to taste. Reduce for a further 5 minutes. Strain the sauce and keep warm. Remove the meat from the refrigerator and from the marinade. Let stand at room temperature for 15 minutes. Pat dry with paper towel and roll to coat in Cajun spices. Heat a sauté pan with the butter over high heat. Wait for the pan to get hot. Place the meat in the pan and allow to sear for about 3 to 4 minutes each side. Spoon over the sorrel sauce. Serve with roasted garlic and grilled zucchini slices. It’s illegal to buy/sell deer meat in Ohio??? I guess I never thought about it! I guess we all just know people that hunt, if we don’t ourselves. This dish is probably not for me, though, as I’m not a big venison fan. So if you’re not fortunate enough to have a hunter in the family, what do you substitute for the deer? I would think a tender piece of beef would work just fine.